They usually hang from a hook in my garage, but as I write this, they are stretched across my lap. 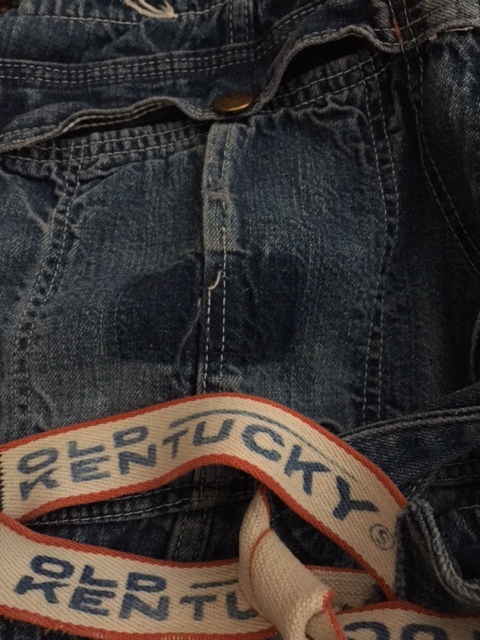 Faded to a soft blue, the denim worn and tattered in places and one of the hooks sewed to the fabric where a button is missing, my grandfather’s Old Kentucky overalls are a tangible testament to a working man’s life and I treasure them. 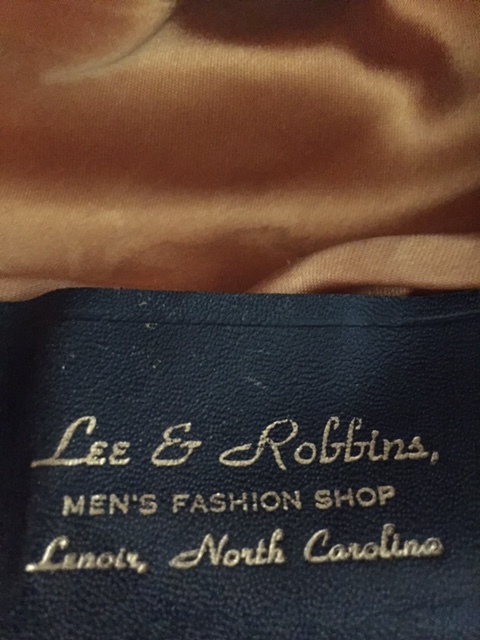 Although he died in 1973 and this garment has been washed many times, in my olfactory memory bank, I can still smell a trace of Pa Joe. A hint of stale tobacco, sweetened a bit by peppermint he sneaked from the candy dish when my grandmother’s back was turned and that singular Lava soap smell. My grandfather was a contractor who built fine homes and denim overalls served him well when he was on the job and I find, in my role as an organic farmer, they are the perfect apparel. In my former career as a public high school media coordinator, aka, librarian, I was required to wear “professional” dress, even though my duties often included handling filthy equipment, dusting shelving where black widow spiders lurked and even cleaning a faculty restroom. Although, depending upon the principal in charge, there was usually not a formally adopted dress code for staff, casual attire was not encouraged. A colleague once told me her former principal forbade female teachers to wear socks, but when my office temperatures dipped into the sixties during winter months when the ancient heater refused to work, I was grateful for thick socks. For a few years, my coworkers and I donated money to the student benevolence fund in exchange for the privilege to wear blue jeans on Fridays. When I retired, after thirty years of employment, I found it liberating to wear jeans every day, if I chose to do so. 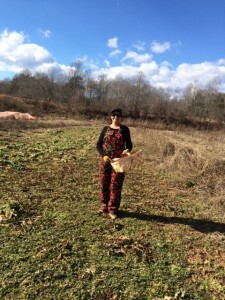 At the farm, I work for long periods of time and it is convenient to carry my cell phone, a pocketknife, small tools and other items in my pockets. 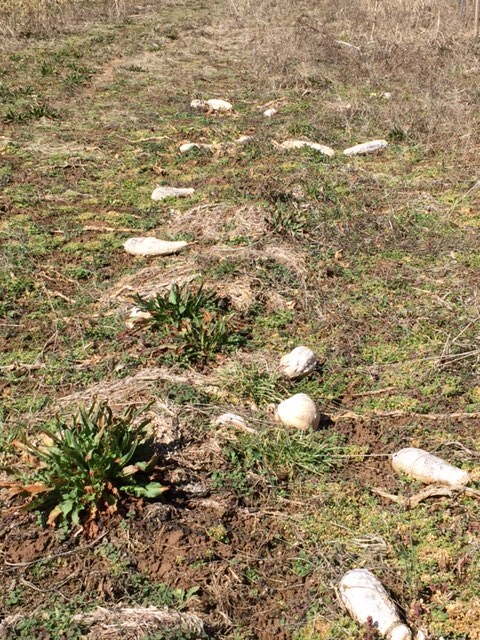 With several cultivated acres, it is difficult to remember to take everything I need from one field to another and I often run back to my vehicle to retrieve something I forgot to take with me. I quickly discovered jeans pockets could not hold everything I needed to carry along. And then, there was that darned cell phone. Stored in a pocket, as I bent to pull weeds or stretched to harvest tall crops, my phone would make calls or send texts. Most of the time, the number belonged to someone I knew, but sometimes, strangers received calls from me. Even after I added the security of a locked code, I would still have occasional problems. Finally, I discovered the freedom of wearing overalls. Not only are the pockets deep enough to carry (almost) everything I need, the fabric is soft and breathes with my body, making it a good choice for hot summer days and for most farm tasks, the long pants protect my legs from cuts and scratches. After wearing overalls, I understand why Pa Joe believed they were the perfect work uniform. When I was a child, it was not uncommon for men, especially farmers, to wear overalls, but they were almost exclusively a work garment. On Sundays and workday evenings, these same overall-wearing men would don slacks, dress shirts, polished shoes and perhaps a hat. In addition to Pa Joe’s overalls, I also have one of his hats. It is made of soft gray felt, adorned with a black grosgrain ribbon and a tiny metal airplane. 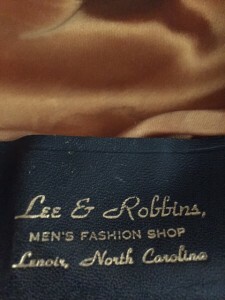 A gold stamp inside the brim reveals it was purchased from “Lee & Robbins, Men’s Fashion Shop, Lenoir, North Carolina.” Although Lee & Robbins is no longer in business, I remember that store, its rich smells of leather and shoe polish and helpful salesmen with tape measures at the ready. At some point, I suppose overalls fell out of favor, probably replaced by blue jeans. When I was a young child, I recall shopping for Pa Joe’s work apparel with my grandmother. We walked down the wide staircase to the basement department of our local Belk store, where there were stacks of dark blue denim overalls for sale. These days, I purchase them from online stores. Although I enjoy wearing utilitarian overalls, they are certainly not trendy and I doubt they will appear on any fashion show runways in the near future. Once, after working much longer than I planned, I realized I did not pack enough water for my trip to the farm and I was very thirsty. I drove to a nearby convenience store and picked up a bottle of cold water. As I walked to the cash register, a man, dressed in a nice suit, with a necktie, walked in the front door, directly in the path I walked. I smiled at him and he looked at my feet, clad in boots, and I saw his eyes widen when he slowly looked up, noted my overalls’ dirty knees, and then, in almost horror, he turned and ran the other way. 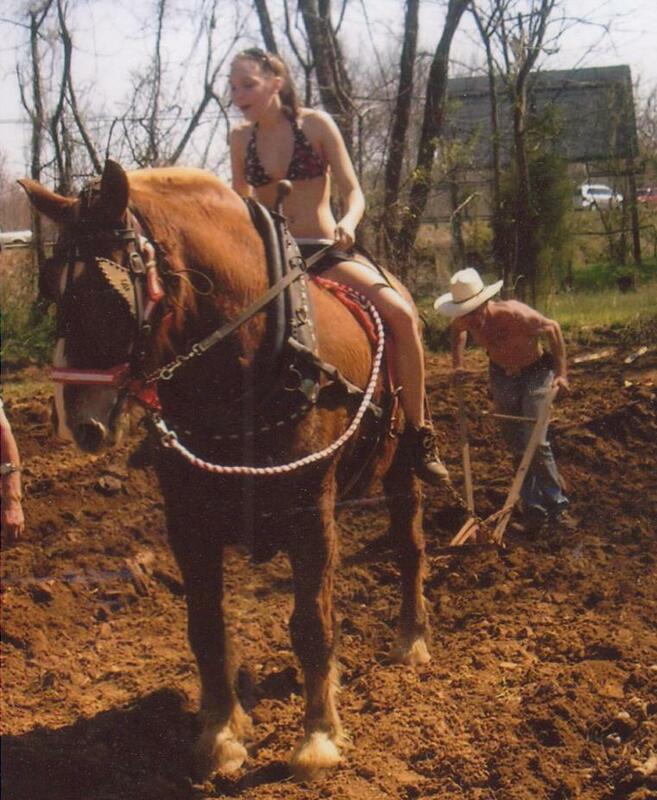 I suppose he was not used to seeing female farmers, dressed in professional work attire. I have learned many lessons while working at Heart & Sole Gardens. Growing my grandmothers’ heirloom seeds, saved by my family for generations, connects me to my ancestors in ways that sometimes surprise me. The physical work strengthens my aging body and the fresh air blows cobwebs of stress from my mind. If you haven’t tried your hand at growing your own food, I highly recommend the job. The dress code is an added bonus. 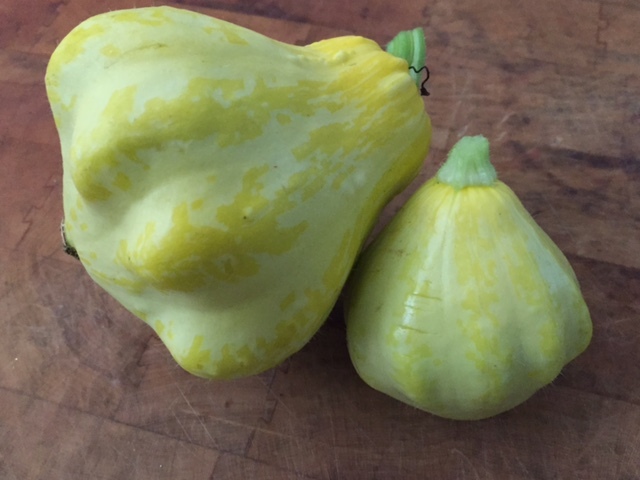 This entry was posted in Heirloom Seeds on August 24, 2015 by cindybarlowe. Falling snow reminds me of my grandmother. For the first twelve years of my life, I lived four doors down the street from Lora Bolick Minton, “Granny” to me and her other grandchildren. During summer, I was Granny’s garden helper and she taught me many lessons about growing and harvesting plants, lessons I thought I forgot, until I grew my own garden. Often, when I reach for a cucumber, I hear her voice reminding me to take care not to step on the tender vines. 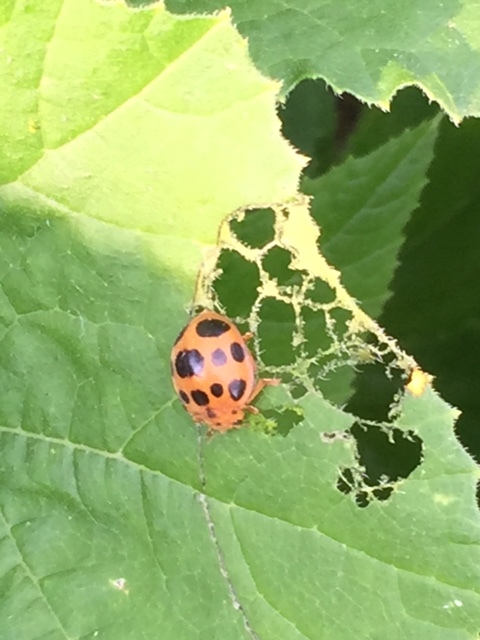 Other times, when insect pests devour seedlings, I remember which bugs she told me were “bad” and should be killed. As much as I enjoyed working in Granny’s garden, which somehow, always felt more like play, I loved being in her kitchen, where enticing aromas wafted from her oven or stovetop, where simmering saucepans of goodness filled every gas burner. At no time was Granny’s kitchen more inviting than when snow was falling. As soon as she spied the first flakes, Granny began to make a huge pot of oyster stew and, without announcement or telephone calls, family soon arrived to enjoy steaming bowls of rich cream soup, topped with a thick layer of churned, melted butter and served with tiny oyster crackers. When I see Squash Beetles, I hear Granny’s voice: Kill It! Oyster stew is a favorite dish in my family, also. Even daughter Kate, who is allergic (sadly) to the bivalves, enjoys the soup base, albeit without oysters. 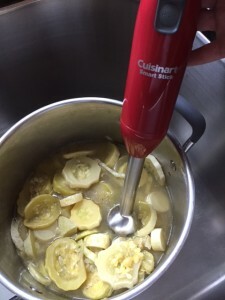 Although my first stews followed Granny’s basic recipe, several years ago I discovered a soup base that is perfect for oyster stew, looks deceivingly rich and buttery, but is actually very low in calories and is heart-healthy. With an abundant crop of summer squash, I made creamy squash soup. I shared some with a friend, who made her own soup and served it to her father. After enjoying a bowl, my friend’s father declared, “The soup was great, but I didn’t get a single oyster!” The next time I tasted the soup, I realized this man’s palate was accurate. The soup did have an oyster stew flavor and appearance, but without oysters. When I added oysters to my next batch, I discovered it is possible to enjoy rich stew flavor, without a dairy base. Since the soup’s color is deceptively close to butter and cream, I call it “Trompe L’Oeil Oyster Stew,” since trompe l’oeil is a French term that means “trick the eye” and is usually applied to works of art that create an optical illusion. 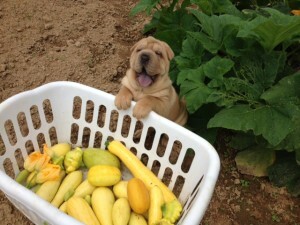 With squash harvest, help is always appreciated! In North Carolina, oysters are not in season at the same time as summer squash. Thankfully, I am able to preserve soup base that retains the flavor and texture we enjoy during squash harvest time. For interesting presentation, top a bowl of this soup with a single, perfectly fried, golden brown oyster. 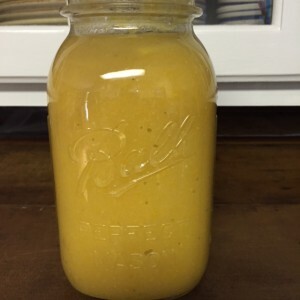 The following recipe is for soup base, but if you are interested in the recipe for fresh squash soup, it is in the “Farm Fresh Recipes” section of this website. I apologize for the lack of organization in that area and fully intend to overhaul it . . . when I get time. For now, it is squash season and I am madly processing! Saute onion and pepper in oil until translucent, about 2 minutes. Add 4 cups vegetable stock and 12 cups summer squash, sliced into 1/4 inch pieces. Season with 1 teaspoon sea salt, not iodized (I used French Grey) and 1/2 teaspoon ground white pepper. 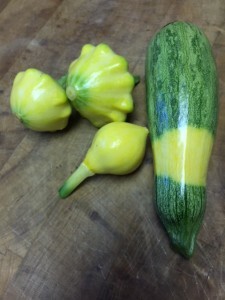 Cover stockpot with lid and cook over low heat for about 20 minutes, until squash begins to fall apart. Remove pot from heat and allow to slightly cool. 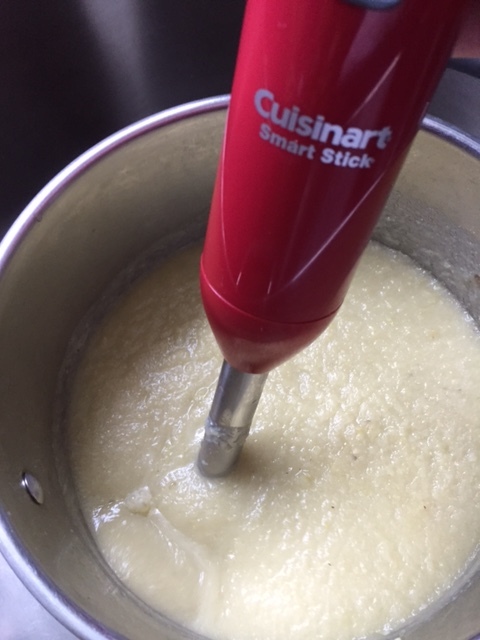 Use an immersion blender to blend squash mixture until very smooth. Alternatively, place mixture, in small batches, in a stand blender and blend until smooth. Heat soup base over medium heat until boiling, then remove from heat. 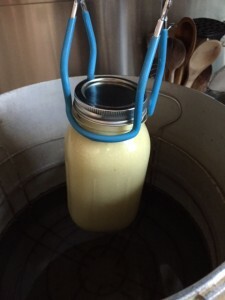 Immediately fill hot glass canning jars, either pints or quarts, to within one inch of the top of the jar, with soup base. Carefully wipe jar rims with a clean damp cloth and affix lids, screwing tightly to close. 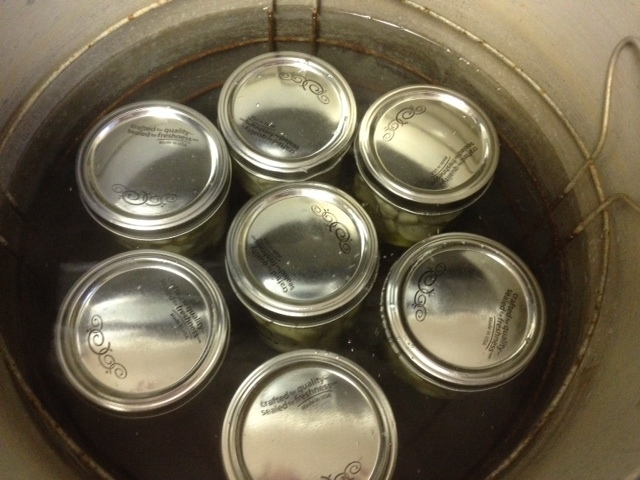 In a large pressure canner, process soup at 10 pounds of pressure, 40 minutes for quarts and 30 minutes for pints. 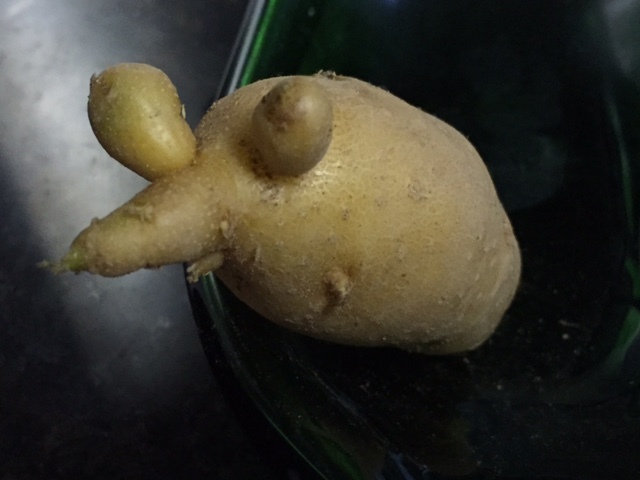 This entry was posted in Heirloom Seeds on July 14, 2015 by cindybarlowe. I know it will happen very soon. I will drive into the fields at Heart & Sole Gardens and I will miss the greeting I usually receive from my short-term residents, the Purple Martins. Migratory birds, these social creatures arrive mid-spring at our farm from their winter residence in South America. From April until July, or sometimes early August, these beautiful winged birds delight us with their aerodynamic stunts, their distinctive chatter and their dramatic antics. Since they only eat flying insects, the Martins are also valuable unpaid organic farm workers, devouring scores of pests from morning until dusk. Before Richard and I erected the poles that support birdhouse gourds, inviting Martins to spend summers at our farm, we researched the birds’ possible negative impact on our honeybee colonies. After all, we did not want to encourage predators to live in close proximity to the hives where they could eat our hardworking pollinators. After months of reading everything we could find about the issue and discussing it with other local bee keepers and Martin enthusiasts, we found no definitive answers to our questions and since numerous other songbirds lived at the farm, we decided to take a chance with Martin housing. In the Eastern United States, Purple Martins are dependent upon humans who provide housing, but even when clean, appealing gourds or other homes are ready for residents, there are no guarantees Martins will select what is offered. 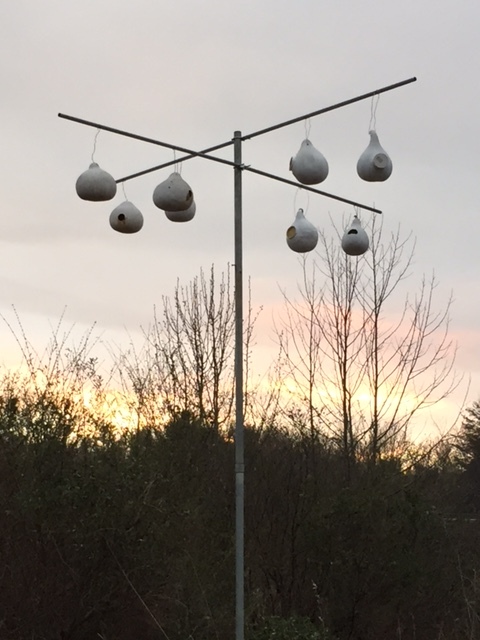 Fortunately, a few days after we hung our first birdhouse gourds, freshly painted and cleaned, Purple Martins claimed them and eagerly began to build nests inside their new homes. For the next few years, we welcomed “our” birds back to the farm. They seemed to recognize us and chattered excitedly when we pulled off the highway to drive along the farm path, swooping over the truck and showing off their flying stunts. Often, while working at the farm, I hear a cry of alarm from Martins when hawks fly too close to the nesting area or, occasionally, the predators sit on the poles, hoping to gobble a Martin baby. When I hear that strident signal of trouble, I run toward the gourds, shouting loudly at the would-be attacker and waving arms over my head. Long after the hawk flies away, Martins circle my head as I work, pleasantly chattering, as if they are grateful for the help. As if to celebrate ridding themselves of predatory birds, Martins will often “wing bump” each other as they fly. 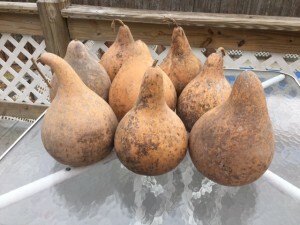 Although synthetic gourds are available for purchase, we only use natural dried gourds for our Martin housing and the birds seem to prefer these. Last winter, after years of Martin use, I found cracks in some of the gourds while I was cleaning them of old nesting material and dirt, so I began the process of creating new housing. 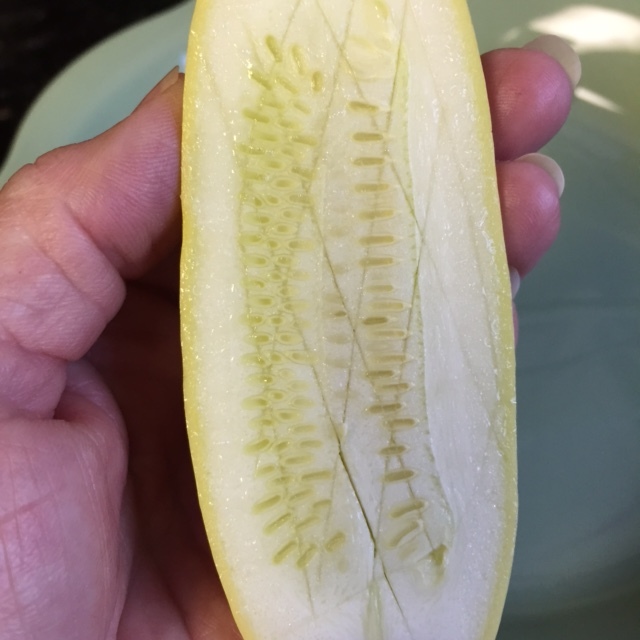 After cleaning dried gourds, I used a pattern to cut a half-moon shaped opening that works for Martins, but discourages English Starlings, an invasive species that will lay eggs in Martin nests, then leave the eggs for Martins to care for, along with their own offspring. 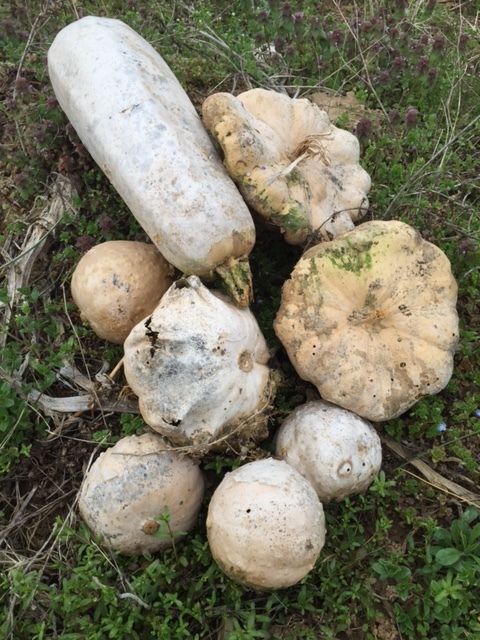 Bluebirds also love the Martin housing, but at Heart & Sole, the Martins are able to claim the gourds for their own. 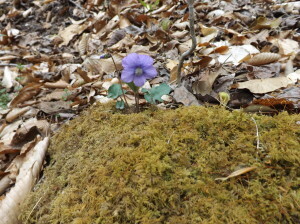 This spring, however, was different. After hanging the new gourds, we waited for our first arrivals. And waited. I checked the Purple Martin Conservancy’s scout report page http://www.purplemartin.org/scoutreport/ and saw that other hosts in our area welcomed birds, but ours were still no-shows. In late March, two scouts arrived, but after a couple of days, they disappeared. Richard and I discussed possible scenarios for our missing birds. In late winter, work was completed for a creek restoration project at Heart & Sole, so perhaps the different terrain was not acceptable. Could it be the scouts did not favor our new housing? Perhaps “our” Martins found a site that was more appealing? 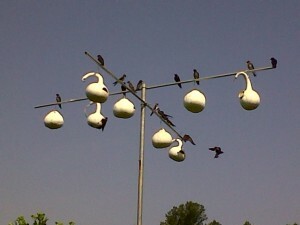 Just when we thought we might have to face a season without Martins, a scout arrived, much later than usual, but we were thrilled when we observed, in early May, several Purple Martins claiming gourds. Almost immediately, we noticed our latest colony exhibited different behaviors from the birds we previously hosted. For one, they were not as social as our earlier families. By late June, they tolerated our work when it took us near their homes, but they were not as chattery or welcoming as earlier birds. Another difference we noted is that these Martins often perched on tomato cages, tree limbs or even freshly tilled soil, unlike other Martins that only used their gourd support poles to rest. A few weeks ago, I watched a Martin take a “dust bath,” a first for me. Birds will sometimes scratch to create loose soil and then flap wings to settle the dust on their feathers. This is common among some species and helps to keep feathers healthy and groomed, however, I had never seen a Martin take a dust bath. Since there had been weeks without rain and more birds tend to dust bathe in arid climates, I suppose this could have been the reason. Still, it was an unusual sight. It is always a treat to watch fledgling birds fly for the first time. Often, I witness parent birds encourage young Martins to leave the nest. 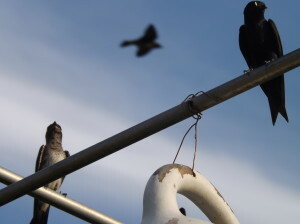 Purple Martins only eat live, flying insects, so the parents will stop feeding their young, hoping to drive the hungry young birds out of the gourds to catch their own food. Adults fly to the gourds, where open mouths and stretched necks reach to them, only to pause briefly and then fly away, leaving the baby birds hungry enough to follow. Several days ago, I saw two young male fledglings attempt to land at the same spot on a birdhouse support pole, only to crash into each other and fall toward the ground before gathering their wits to fly again. When all fledglings join the adult birds and soar overhead, working to perfect those daredevil moves, it is an incredible sight. As we prepare for the inevitable Martin departure, Richard and I are making plans to visit eastern North Carolina where thousands of Purple Martins gather before they make the long flight back to South America. We joke about how the time these birds sped “down east” must be like attending a huge family reunion, complete with lots of food and conversation. We hope “our” birds will have safe travels and we look forward to next spring when scouts will, hopefully, choose our gourds to raise their young. 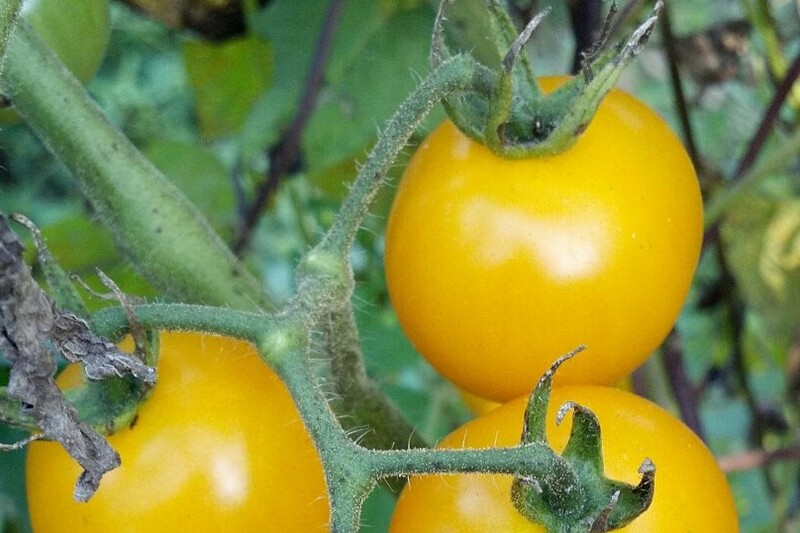 This entry was posted in Heirloom Seeds on July 6, 2015 by cindybarlowe. Can Snake Oil Save Honeybees? 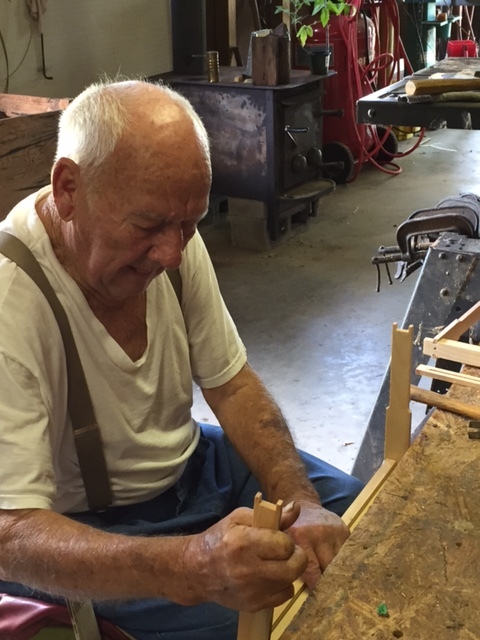 84-year-old beekeeper, Tate Poarch, constructs a brood frame in his shop. On Easter Sunday, guests of Heirloom Restaurant, in Charlotte’s Coulwood community, witnessed an interesting phenomenon when the restaurant’s rooftop honeybees swarmed and thousands of bees settled on a planter near Heirloom’s front door. 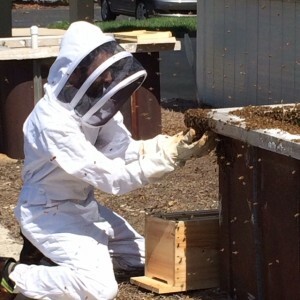 When a manager informed him about the incident, Chef Owner and resident beekeeper Clark Barlowe stepped away from the line, donned his bee suit and captured the swarm, using his hands to scoop bees and place workers and their queen in a new home while brunch guests crowded in the restaurant foyer, eager to watch the unexpected show. During Easter brunch service, Heirloom Restaurant’s chef owner and beekeeper, Clark Barlowe, scoops bees into a new home. Although Heirloom’s rooftop hives and those housed at Charlotte’s Ritz-Carlton hotel may be a novelty for urban residents, the European honeybee is arguably one of the most popular and important immigrant species in the United States and is designated as official insect in seventeen US states, including North Carolina. First imported from England to Virginia, probably around 1622, it was not until the mid-1800s that honeybee colonies reached California. Today, honeybees impact more than 14 billion dollars’ worth of agricultural crops in the US, a tremendous responsibility for a creature whose lifespan is about a month. In addition to honey, which is over a quarter of a billion dollar US product, honeybees produce beeswax, pollen, propolis, a sticky resin bees mix with wax, and royal jelly, a substance worker bees feed to queen larvae. Both propolis and royal jelly are widely marketed as medicinal and cosmetic products, but biodynamic honeybee experts abstain from collecting royal jelly, due to the fact that robbing hives of this substance can kill developing queens. Formic acid, the venom honeybees inject when stinging, is used to treat a variety of human medical issues such as high blood pressure, elevated cholesterol levels and arthritis. Many US crops depend upon honeybee pollination and California almonds, the top specialty export crop in the nation, creates the largest demand upon honeybees, along with one of the most negative impacts on bee health. Because the almond crop must be pollinated while trees are in bloom, growers employ migratory beekeepers to transport thousands of colonies to the groves and the bees often travel for many hours before they are released from their confines, stressing the health of the colony. According to a report published by Gordon Wardell, on the USDA’s website, over 80,000 honeybee colonies were negatively affected during the 2014 almond pollination season, with most damage attributed to herbicide sprays. With a conservative estimate of 10,000 resident honeybees in an average hive, that figure translates to more than 800 million lost lives. Such statistics, along with a syndrome known as Colony Collapse Disorder (CCD), a term applied to dead hives where adult worker bees mysteriously disappear, spurred honeybee activists to press for practices and legislation that will protect honeybee health and at no time in US history has this impetus been more public or its proponents more vocal. Since 2006, US honeybee colony numbers show an annual decrease, spurring many of the estimated 200,000 beekeepers, pollinator experts, governmental agencies, corporate manufacturers and individuals to seek causes for honeybee deaths and solutions to prevent future losses. Experts offer a variety of factors as possible bee killers. Disease, stress, parasites, particularly the Varroa mite, a parasitic pest that can destroy honeybees, harsh winters and lack of available food are all negative forces that may harm colonies. Perhaps the most controversial honeybee adversary comes from chemical factories that produce agricultural pesticides and herbicides, particularly a class of collective pesticides, neonicotinoids, or “neonics,” as they are commonly called. Introduced to farmers over twenty years ago, neonicotinoid pesticides are chemically similar to nicotine and they attack the central nervous system, causing insect paralysis and death. Touted by production companies, like Bayer and Syngenta, as being systemic seed treatments that protect plants from insects in early growing stages, pollinator proponents are increasingly concerned about the collateral damage neonics cause to non-target insects, particularly honeybees. In North Carolina, neonicotinoid pesticides are primarily used by farmers who plant large corn and soybean crops. According to a USDA 2014 Annual Crop Summary Report, NC farmers planted 840,000 acres of corn for grain, primarily using genetically modified (GMO) seed treated with a neonicotinoid. With an average yield of 132 bushels per acre, these statistics reflect a decrease in 2013’s 930,000 acres planted, but corn remains an important crop for North Carolina. When farmers use machinery to place seeds in the field, they add lubricating agents, like talc and graphite, to help seeds pass through the machine and the equipment’s exhaust system releases dust particles from the seed and lubricant, creating a “fog” of corn dust that contains pesticides. The corn dust settles not only on the field that is planted with the treated seed, but in adjacent areas that grow plants honeybees use for food. Because neonicotinoid pesticides are a genetic component of GMO corn seed, traces of the insecticide are also released when the plant pollen travels with wind currents. When pollen from these treated crops settles on other plants that honeybees use for forage, pollinators are exposed to the insecticide. A 2013 report published by the European Food Safety Authority (EFSA) raised alarms about neonicotinoids’ harmful effects on honeybees. According to EFSA’s Media Relations Officer, Jan Op Gen Oorth, EFSA scientists “identified a number of risks posed to bees by three neonicotinoid insecticides, which are clothianidin, imidacloprid and thiamethoxam.” A Bayer company employee confirms the pesticide used in treated corn seed commonly planted in North Carolina is clothianidin. Not that Bayer is completely ignoring the purported ill effects of clothianidin. In a February, 2014, press release, Bayer CropScience announced a new seed lubricant “Fluency Agent” to be available to US farmers. 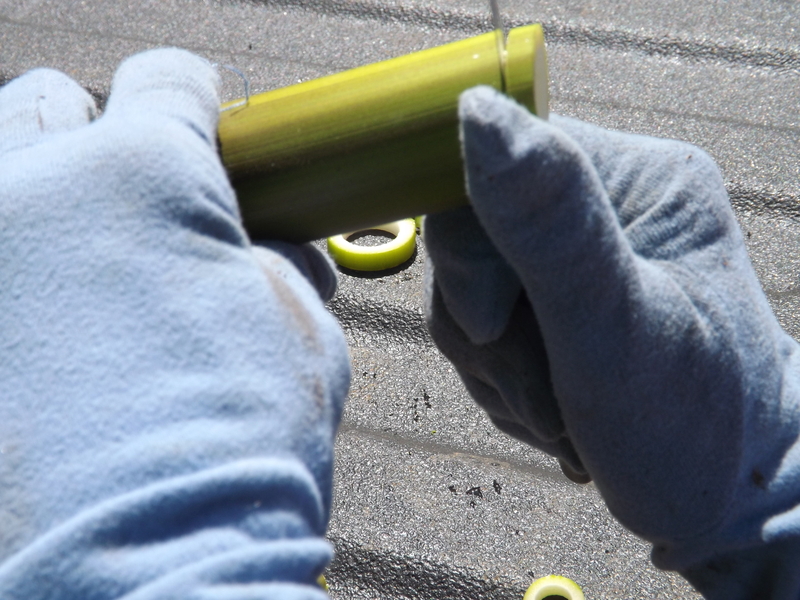 As stated in the release, the “Fluency Agent is a seed lubricant for corn and soybean seeds, which is designed to replace standard talc and graphite seed lubricants. In lab tests, the product was shown to help reduce the amount of total dust released in treated seeds by 90 percent versus talc and 60 percent versus graphite, thus reducing the potential risk of exposure to pollinators, if they come in direct contact with the dust during the planting process.” Although Bayer stops short of taking responsibility for contributing to honeybee deaths, marketing Bayer Fluency Agent (BFA) indicates a certain corporate culpability. Adding to concerns about neonicotinoid pesticide use, recent studies, like one published in the science periodical, Nature, indicate honey bees and other wild pollinators, such as bumblebees, prefer food that contains neonics, even though the poison-laced forage food tastes bitter, suggesting that bees, like humans, may become addicted to nicotine. 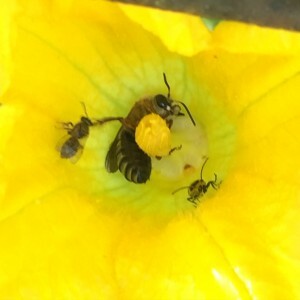 Chemically similar to nicotine, neonicotinoids may be especially damaging to wild bees, report scientists from Newcastle University. In the United States, neonicicotinoid opponents appear to be gaining ground. In August, 2014, the US Fish and Wildlife service announced neonicotinoid pesticides will be completely banned on wildlife refuges by January, 2016. Recently, Lowe’s Home Improvement’s annual corporate responsibility report included plans, over the next four years, to phase out selling products that contain neonicotinoids. After environmental protection group, Friends of the Earth, released a June, 2014 study that reported over fifty percent of sampled “bee friendly” plants sold by major retailers in eighteen cities in the United States and Canada contained neonicotinoid pesticides, some companies, including Home Depot and BJ’s Wholesale Club, required wholesalers to label neonicotinoid-treated plants. Identifying the presence of neonicotinoids, this label is included in flowering plants bees use as forage. In June of 2014, faced with reports of an annual thirty percent colony loss of honeybees, every year since 2006, more than two times earlier recorded losses, President Obama announced representatives from the Environmental Protection Agency (EPA) and the United States Department of Agriculture (USDA) would lead a Pollinator Health Task Force, a group whose mission is to develop an action plan to protect pollinators and create healthy habitats to restore their numbers. In early March, a group of concerned environmental and food safety advocates, along with honeybee activists, rallied in Washington, D.C., urging the Obama administration to protect pollinators and presenting over 4 million petition signatures in support of their cause. Recently, Portland, Oregon, elected officials passed a pesticide ban that prohibits insecticide use on any public municipal property and on March 19th, HF 2029, a bill authored by three members of Minnesota’s House of Representatives, was presented to that governing body for consideration. HF 2029 calls for a five year moratorium on the use of neonicotinoids and fipronil, pesticides identified as harmful to honeybees. In North Carolina, Associate Professor and Extension Specialist of Entomology at NCSU, Dr. Dominic Reisig, is currently researching to see “how effective neonicotinoids are in corn for various soil insect pests compared to granular and liquid-in furrow non-neonicotinoid insecticides” while NC Farm Bureau’s Director of Specialty Crops, Debbie Hamrick, is serving as “the point person for an interagency working group that is facilitating discussions between farmers and beekeepers in North Carolina.” Comprised of representatives from various agencies and groups, including commodity growers, NC Department of Agriculture, Farm Bureau and others, the group is looking at successful endeavors like Mississippi’s “Bee Aware” flag program. 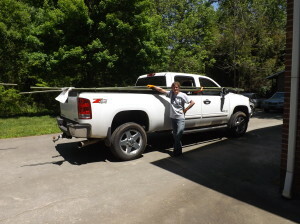 A component of the state’s Cooperative Standards for row crop farmers and beekeepers, 8 foot tall poles and flags are presented to beekeepers to locate hives, thereby alerting farmers to sensitive areas before pesticides are used. Ultimately, Hamrick hopes the group, working with no allocated funds, will help encourage North Carolina to develop a Pollinator Protection Plan, a document currently discussed by the North Carolina Beekeepers Association, the largest organization of its kind in the US, according to Hamrick. 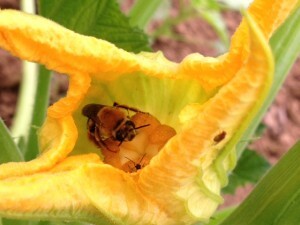 A honeybee pollinates a squash blossom. 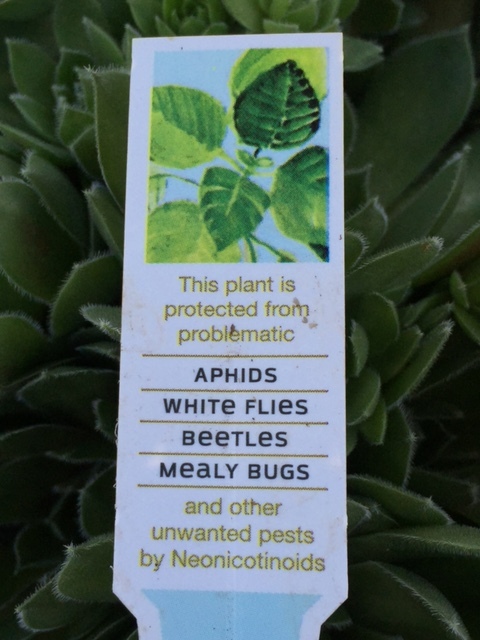 *Before purchasing plants for backyard gardens, check to be sure the plants are not treated with neonicotinoid insecticides. 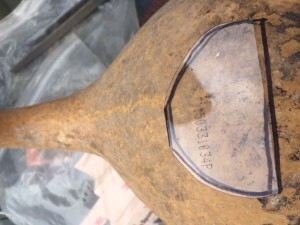 If there is no label to indicate such, ask the seller. Better yet, grow flowering plants from heirloom seed and enjoy the gardening process as you provide healthy, chemical-free forage for pollinators. *Give up that 1950s perfectly-manicured, weed and bug free lawn dream and allow your yard to provide a bee forage habitat, complete with blooming clover and dandelions. *Decrease, or try to eliminate, grain corn from your diet. Purchase non-GMO seed corn when possible. If you are unsure if corn is non-GMO, buy from a reliable grower and ask about the seed he/she planted. *Above all, consider the tiny worker bees that pollinate many of the foods you eat and pause to be grateful for their efforts. 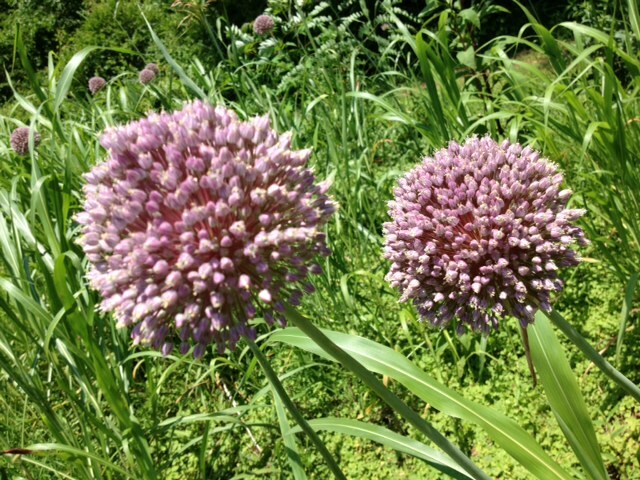 This entry was posted in Heirloom Seeds on June 14, 2015 by cindybarlowe. My grandmother’s recipe notebook includes many handwritten recipes. I love a hand-written recipe. Some of my favorite recipes are ones that were hurriedly scrawled on the backs of church bulletins, while others are beautifully scripted on special cards. When a cook takes time to write a recipe by hand, I believe that document seems to reflect some of the writer’s personality. Although I enjoy the convenience of word processing, I treasure my collection of hand-written recipes. Don’t get me wrong; I also love a good cookbook. Every time I vow I will never again buy another one, there is always a tempting new publication, filled with mouth-watering recipes and beautiful color photographs, which finds a spot on my bookshelf. There should probably be a twelve-step program for cookbook addicts like me. I understand the need to have recipes. While cooking is my stress relief and my dream job would be to professionally develop new recipes with the organic ingredients I grow at my farm, it is comforting to read step-by-step instructions that combine specified ingredients to produce consistent results. Recipes satisfy the librarian in me and I appreciate their orderliness, but perhaps there is more to recipes than just making delicious food. Along with Granny’s handwritten recipes are others she clipped from newspapers, picked up at the supermarket in the store’s weekly newsletter or received in the mail from friends. One unique recipe is “for pneumonia” and is in Granny’s mother’s handwriting. Mary Elizabeth Bean Bolick, born in 1885, raised ten of her eleven children to adulthood and in the early 1900s, with no nearby hospitals and few local physicians, Caldwell County residents often relied upon medicinal herbs, tinctures and other homemade medicines to treat illnesses. This home folk remedy is a mixture of camphor oil, carbolic acid, turpentine, and lard, dissolved over heat. The recipe instructs to dip warm, clean cloths into the mixture and apply them to the chest of the sick person, changing cloths every fifteen minutes. I am not sure if Granny ever used this recipe, but I am glad to have this special gift, with its insight into a more self-sufficient time, from my great-grandmother. Other recipes I treasure are those shared with me by friends. 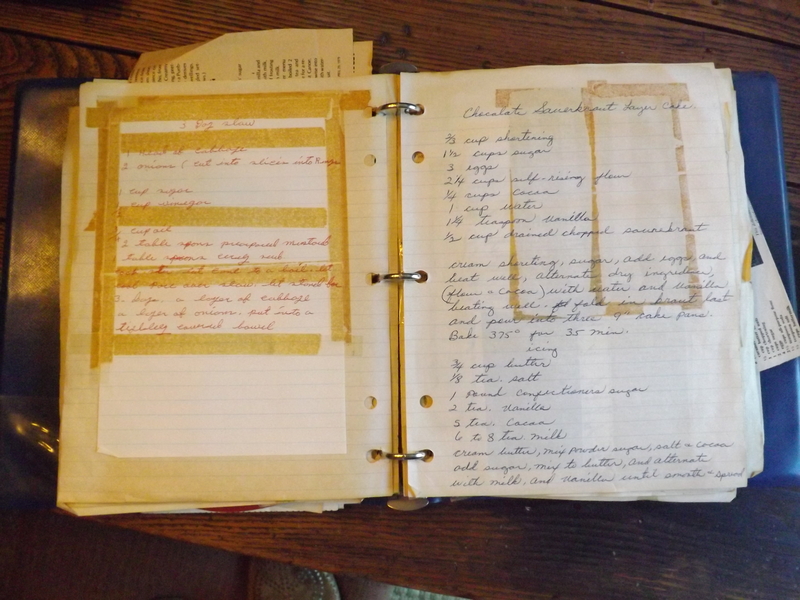 Margaret Carter Martine, a longtime friend, has given me many recipes over the years, some in her handwriting, such as a delicious roasted potato dish, and others copied from typed cards, magazine articles and cookbooks. Margaret and I share a love of good food, prepared well, and enjoyed with friends and family. Of all the recipes Margaret has given me over the years, my favorite is one that was created by her grandmother, Edith Kyles Ferguson. A resourceful woman, Mrs. Ferguson used the bamboo growing on her farm to make pickles and it was her recipe, prepared by her daughter, Edith Ferguson Carter, that delighted my children’s taste buds with the salty, tangy flavor and crisp texture. When Margaret taught me to harvest and pickle bamboo, my kids were thrilled to finally have all the bamboo pickles they wanted and they often, for a snack, opened jars and ate every single pickle. 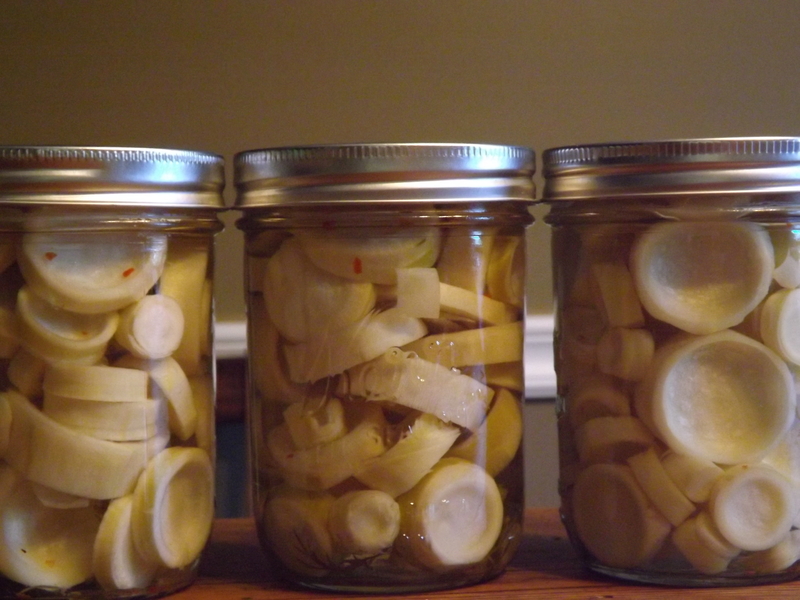 I make pickled bamboo each year and though my pickling solution is slightly different than the original recipe, (I use the handwritten recipe given to me by my husband’s grandmother, Vestal Anderson) my children, now adults, eagerly look forward to enjoying this special treat. 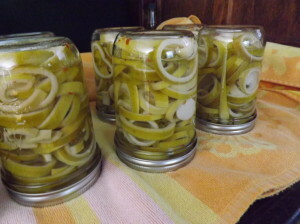 Last fall, I shared some pickled bamboo with a group of my high school classmates. (Yes, we still stay in touch and although we live in different towns, we often speak and frequently visit each other.) Two of my friends asked if I would share the recipe and we made plans to harvest and pickle this spring. 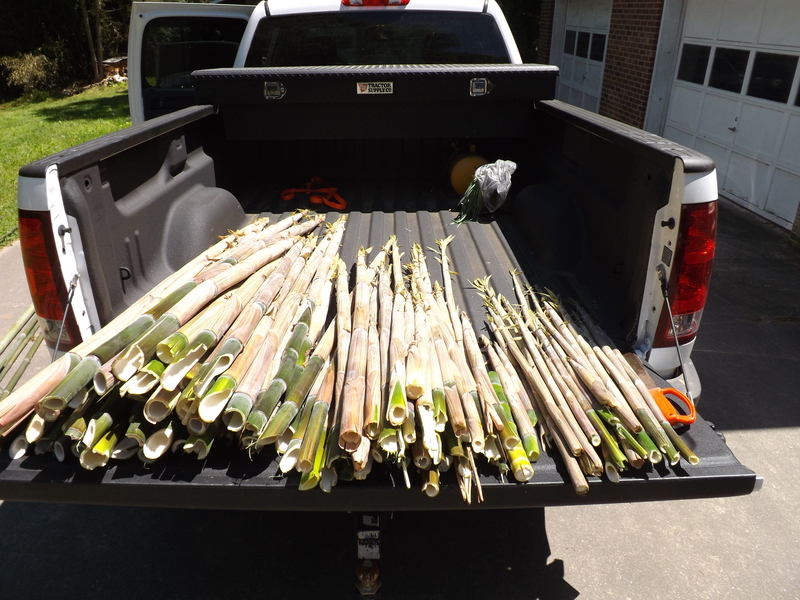 Last week, we met at the home of our former high school English teacher, Louise Adderholdt, who allowed us to harvest from her abundant crop of bamboo. Louise’s husband, George, graciously showed us the property where a thick grove of mature canes and emerging shoots were visible. We set to work, and despite the warm day, we donned long-sleeved shirts, jeans and gloves to protect us from prickly bamboo limbs and lurking creatures in the thick vegetation. Wielding pruning shears and a sharp machete, we cut our way through the patch and dragged the shoots to a collection point. 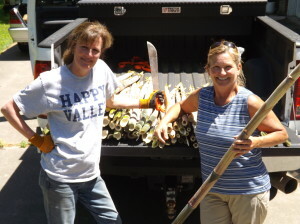 Karen and Kim decided to take some mature canes to use in their gardens to trellis bean vines and we trimmed branches until the long poles were clean. 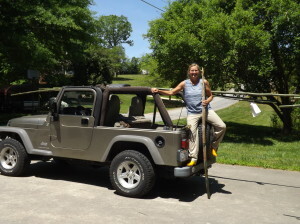 After dividing our harvest, we loaded our vehicles and lashed the long poles to Kim’s Jeep and Karen’s truck with cords and a bit of duct tape supplied by helpful George. As we drove away, we noted we were hot, dirty and extremely happy. Bamboo harvesting is probably not an activity most people would enjoy, but our group looked forward to processing pickles and eating the fruits of our labor. 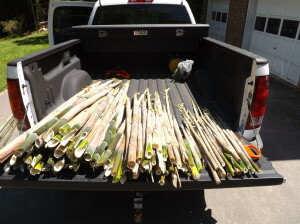 Bamboo fills the back of Karen’s truck. These shoots will yield thousands of tasty pickles. Harvest tender shoots of fresh bamboo. Carefully strip each outer husk from one section at a time. Working quickly, slice the bamboo into rings. Bamboo begins to harden when it is exposed to air, so it is easier to immediately slice each section as it is peeled. Kim demonstrates slicing exposed bamboo. Work carefully around each joint section and peel the tough outer skin from the joint sections. The joints, canned separately, make excellent canape servers for egg salad or other appetizers. The tender tops of the shoots are difficult to work for pickles, so those may be used for another dish or discarded. When slicing, if you notice a dull sound, discard the bamboo, since it will be too tough for pickling. 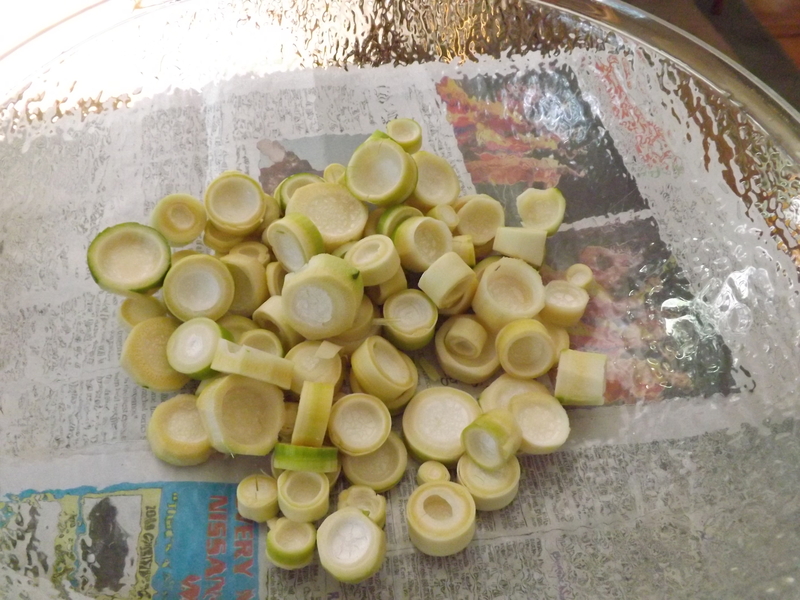 After all bamboo is prepared, place in a large pot, cover with water and bring to a gentle boil, cooking for about 10 minutes and then drain bamboo and immediately place in ice water to blanch. Using pint jars (wide mouth are easier), add a tiny bit of alum, a dash of red pepper flakes and a clove or two of garlic (I use fresh from my garden) and a sprig of dill. Dried dill may be substituted. 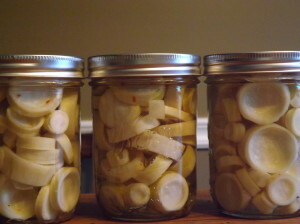 To make the pickling solution, combine 2 cups white vinegar and 1 3/4 cups water in a large pot. Add 4 tablespoons kosher salt and heat and stir over medium heat until salt is dissolved. Note: Gran Anderson’s original recipe includes 3 tablespoons sugar, but I eliminate this from my pickling solution. Pack hot jars with bamboo rings, separating joints, if you like. Gently press to pack tightly. Add pickling solution and leave about 1/2 inch head space. Place hot jars in water bath, boil for about 10 minutes. Immediately remove jars from water, invert onto large, heavy towel for six minutes. Inverting helps to sterilize the head space. 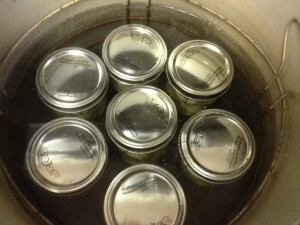 After jars are inverted for six minutes, place upright and cover jars with towel. Leave for 24 hours and check to be sure each jar is sealed. If any do not seal, you may repeat the water bath process or store in the refrigerator. 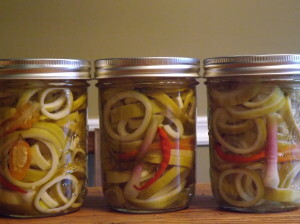 For a delicious, crisp pickle, full of tart flavor, these bamboo pickles are hard to beat. Harvesting bamboo with friends is a bonding experience. 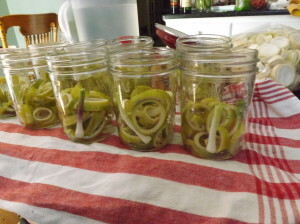 Making pickles with a generations-old family recipe? Priceless . . . 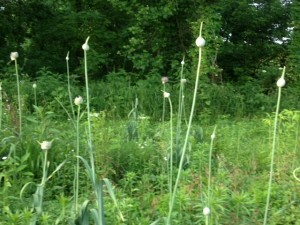 This entry was posted in Heirloom Seeds on May 16, 2014 by cindybarlowe. Chef Clark Barlowe, of Heirloom Restaurant, Charlotte, NC. Not only delicious, but loaded with nutritional value that is lacking in supermarket wares, wild edibles are becoming popular ingredients with professional chefs and home cooks. For those of us who grow our own produce, particularly in harsh winter climates, wild edibles are a welcome addition to our diets and provide a fresh taste that awakens our senses and prepares us for the bounty to come. NOTE: ALWAYS have permission from a land owner before harvesting any wild edibles! For weeks last summer, rain fell almost constantly on my western North Carolina farm and our winter was exceptionally cold and wet. Very few crops produced significant yields and many were a total loss. 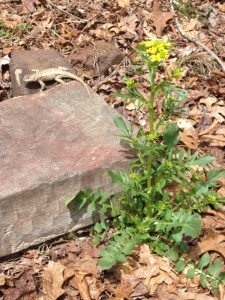 Last week, I surveyed the greens I planted in the fall and noted they were only just beginning to develop mature leaves, although arugula and mustard are both blooming, signaling the end of their season. 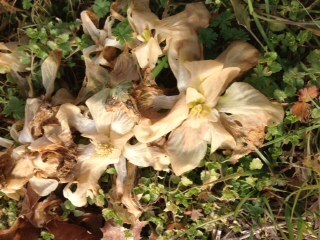 I hope to gather seeds to save for the next planting, but even those will be fewer than in past seasons. 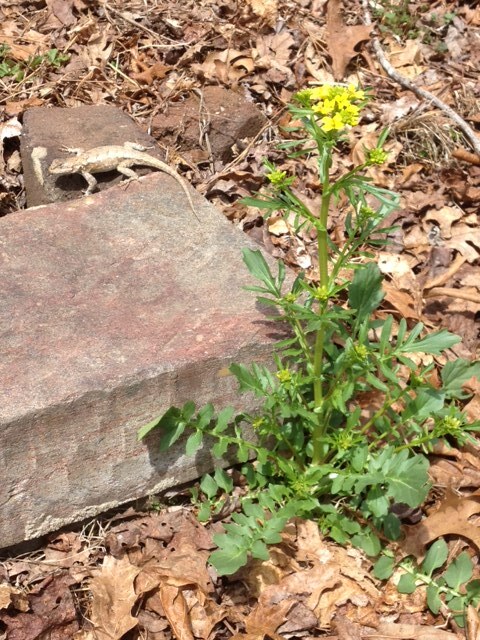 Thankfully, creasy greens, a type of wild cress, is plentiful this spring and we enjoy this spicy green in fresh salads and as an addition to cooked greens. For early Appalachian mountain settlers, creasy greens were the saving grace that helped these pioneers avoid scurvy, a condition caused by Vitamin C deficiency. Loaded with an impressive amount of that vitamin, as well as a significant dose of Vitamin A, creasy greens are easy to identify, gather and prepare. I enjoy them lightly sauteed with wild onion bulbs and dandelion greens. 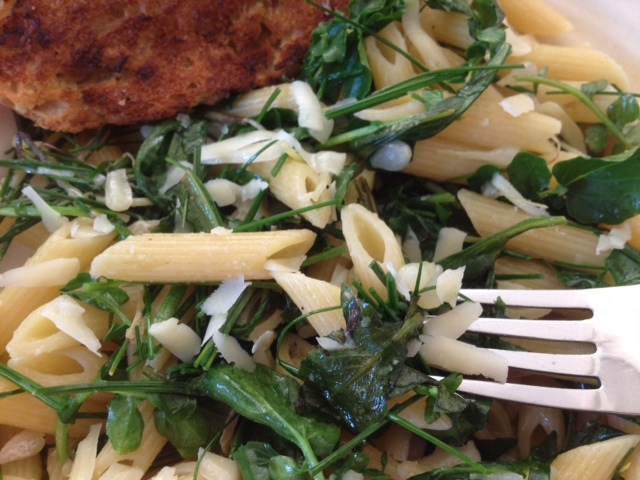 Dandelion greens are also easy to identify and are equally packed with healthy vitamins and minerals. 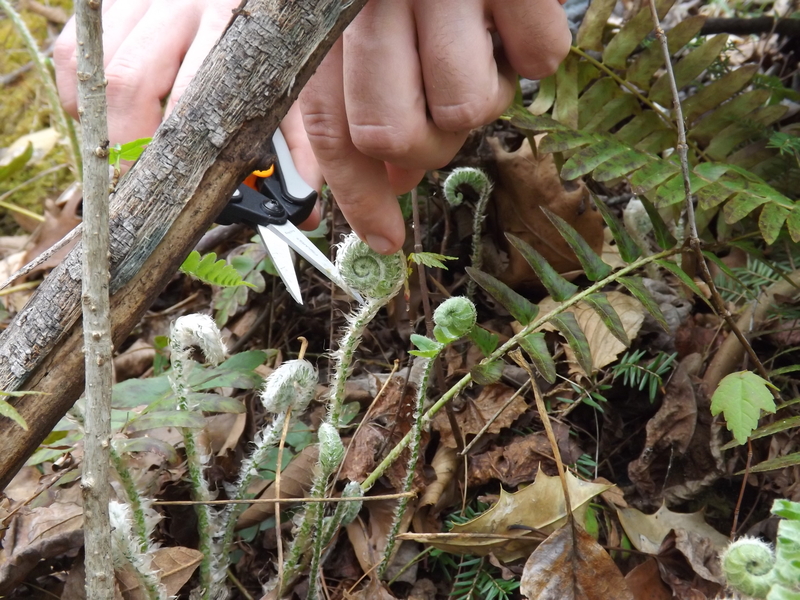 Now that spring is finally warming our days, fiddlehead ferns are appearing in wooded areas and alongside streams. 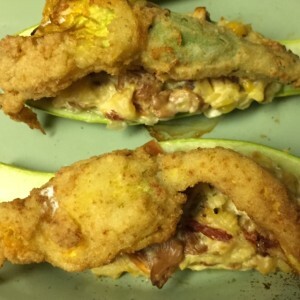 This week, I was fortunate to be invited to accompany Chef Clark Barlowe, owner of Heirloom Restaurant, in Charlotte, NC, on a foraging expedition. 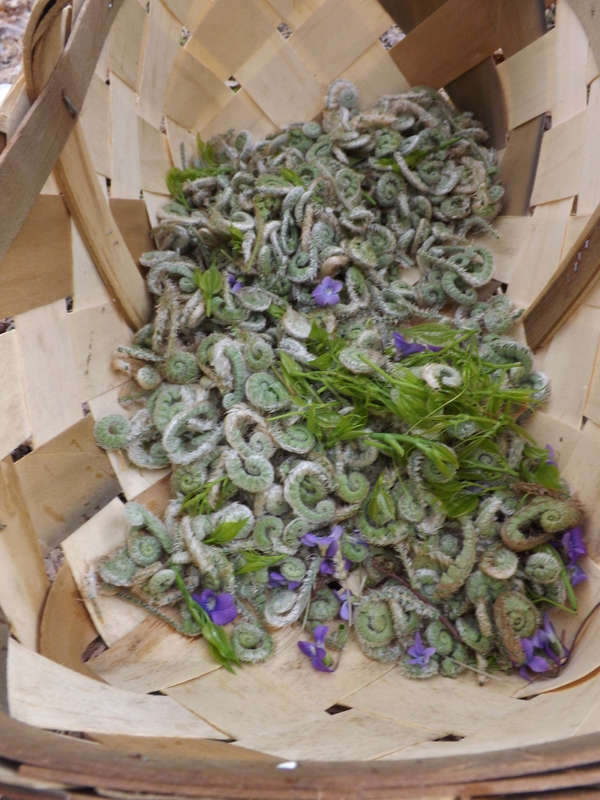 The fiddleheads, wild violet blossoms and saw brier tips he harvested will appear on the restaurant’s menu this week. 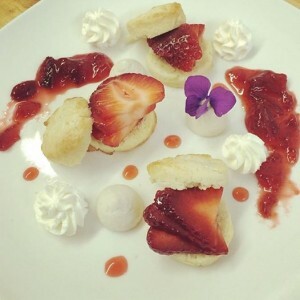 If you would like to try these delicious spring treats, make plans now to visit Heirloom. 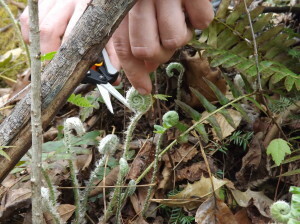 Chef Clark harvests fiddlehead ferns. 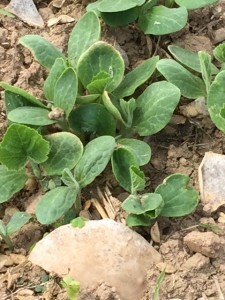 Saw brier tips, small tender shoots that form on thorny green brambles, are delicious eaten raw, in salads, or lightly heated in a small amount of olive oil and served with a sprinkling of sea salt. Deer love saw brier tips and Chef Clark often pulled from high overhead to gather tips that were out of reach for those four-legged eating machines. Wild violets are blooming abundantly and their blossoms are as daintily beautiful as they are delicious. 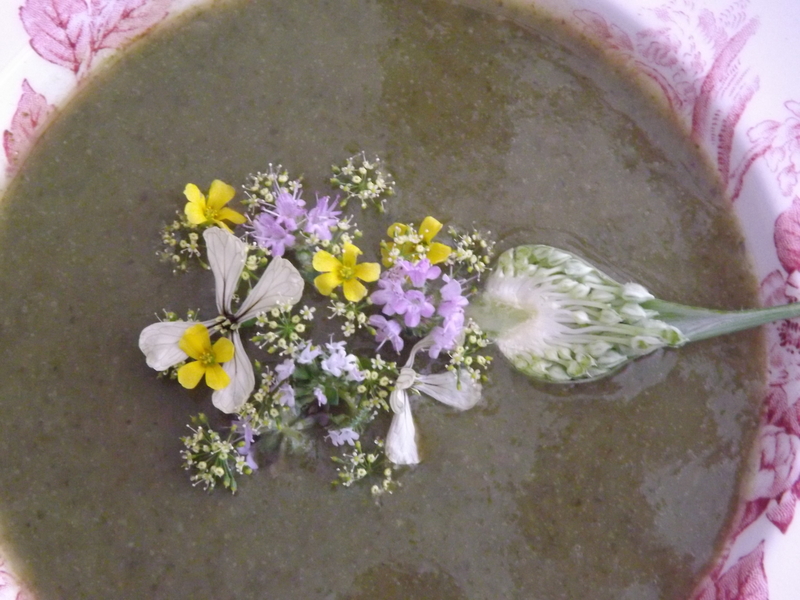 I like to dip violets in beaten egg white, sprinkle them with sugar and allow them to completely dry. As an edible dessert garnish, they are lovely. For a simple, delicious and packed-with-healthy-goodness dish, toss a handful of creasy greens, dandelion greens and wild onion bulbs, diced or whole, in a large skillet with a bit of hot olive oil. Briefly cook and then add cooked pasta to the skillet. Season with salt and pepper. 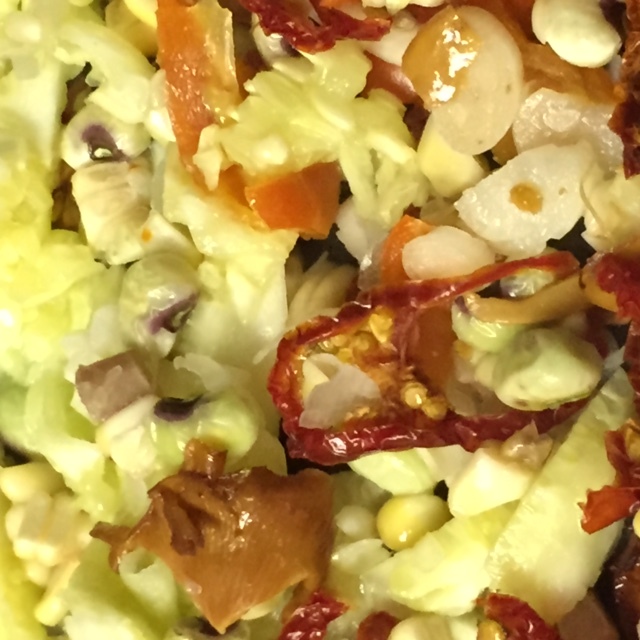 Toss to combine, serve hot, with grated Parmesan cheese and crusty bread. Finish with a splash of herbed vinegar, if you like. I thank Chef Clark Barlowe for allowing me to accompany him as he foraged for wild edibles and I look forward to enjoying his unique, delicious cuisine at Heirloom. 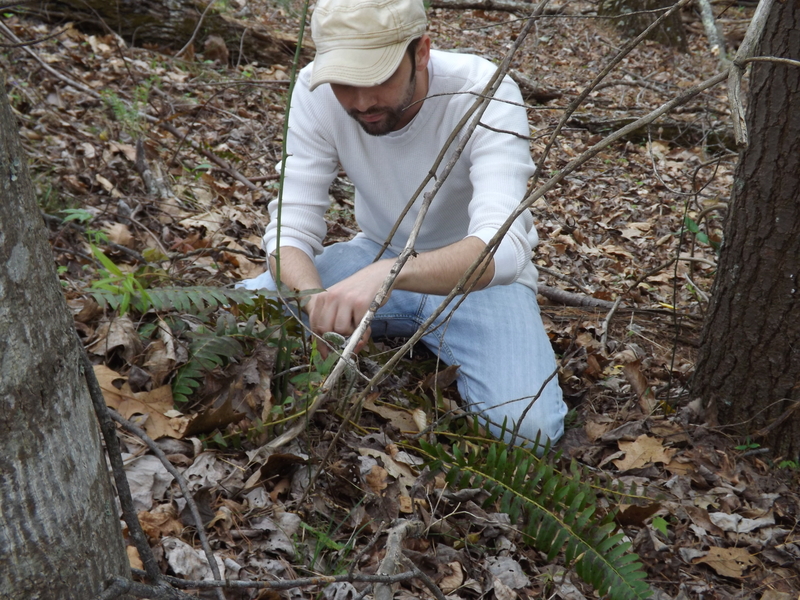 As we left the forest, Chef Clark remarked it will soon be time to gather fresh morel mushrooms. 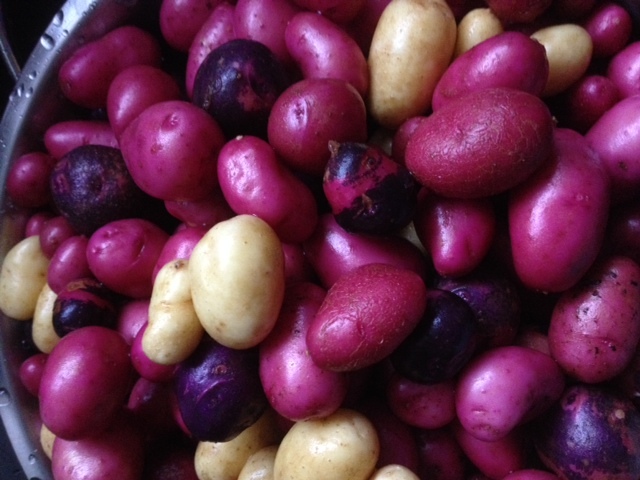 This entry was posted in Heirloom Seeds on April 16, 2014 by cindybarlowe. These are some of the last of the NC coastal tomatoes and the tiny one is the last from my garden. 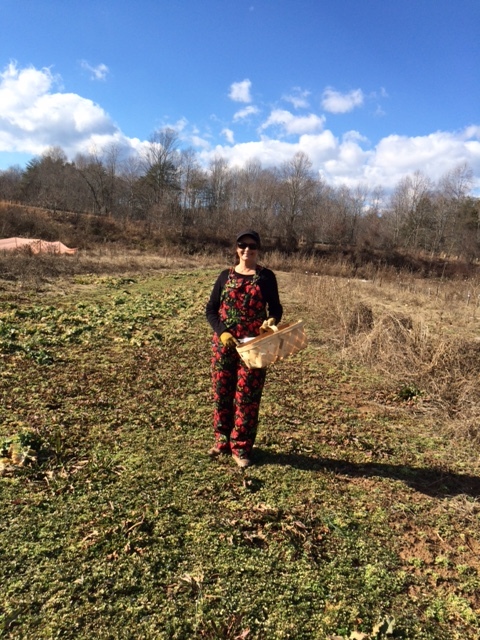 January is always a difficult time for those of us who love to garden in Western North Carolina. 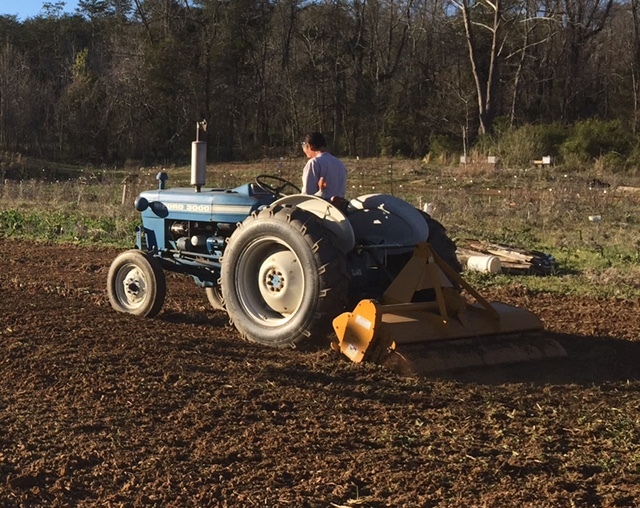 It’s too early to start seeds for most summer crops and with recent single-digit temperatures, many fall food crops are severely limited. When I visited Heart & Sole Gardens yesterday, it was painful to see frozen bok choy and other greens that were viable just a couple of weeks ago. Thankfully, I was able to peel back frozen arugula leaves and harvest some tender salad and although most of the kale, mustard and turnip greens were too bitten to eat, I was able to pick a nice basket of young leaves from those plants. The spinach was almost untouched by cold temperatures and I happily gathered that green in another basket and dug a few green garlic bulbs. Bok Choy did not survive the January freeze. Back at my home, I used the last fresh tomatoes Richard and I purchased during our late fall trip to the NC coast and made a sauce. 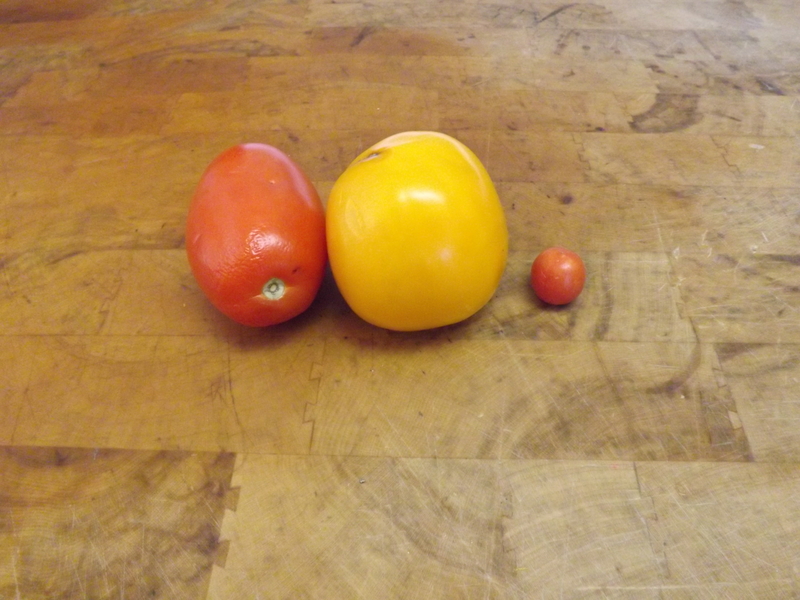 Although too much wet weather this summer made for a poor tomato crop in my area, the fruit we bought at the eastern market was still nice. I know they were grown with “conventional” methods, i.e. added chemicals, and they are not heirloom fruit, but I know the farm where they grow and they are sort of local and in January, I am very thankful for these tomatoes. Recently, spots began developing on the skin and I knew it was time to “use it or lose it,” so I cut the tomatoes into sections and placed them in a pot to cook on the stovetop over low heat. When the tomatoes were completely soft, I allowed them to cool and then used a potato ricer to remove the skins. I put the pureed tomato sauce in a smaller pot and added onion and garlic granules, dried basil and oregano, and sea salt and a few grinds of black pepper. After the sauce cooked for a couple of hours, it reduced to about 1 ¼ cups. I picked up some beautiful baby and portabella mushroom caps at our local supermarket and decided to serve those with the tomato sauce for our dinner. Since I also had fresh baby arugula leaves, I thought they would make a nice addition to a mushroom “pizza.” With a fresh spinach side salad, it was a perfect meal for a cold January night. Use a small, pointed spoon, such as a grapefruit spoon, to remove the mushroom gills from the portabella caps, taking care to keep them intact. 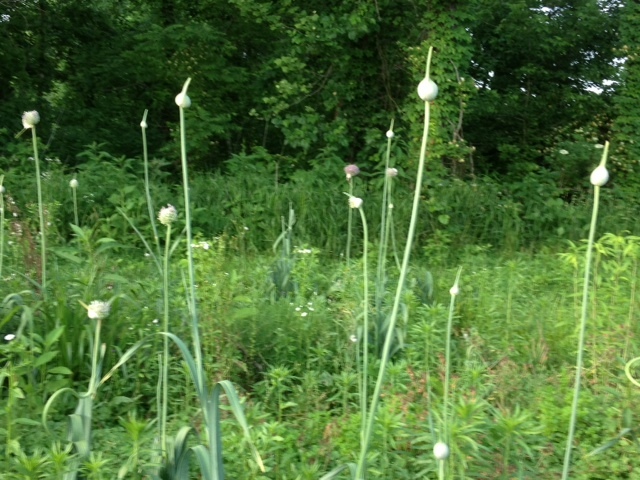 Fresh green garlic bulb next to chopped baby bellas. In a large skillet, heat 1-2 tablespoons olive oil and then add onions and garlic, cooking until translucent, about 2 minutes. Keeping skillet hot, add wine and stir. Cook until vegetables are almost dry, stirring often, about 3-4 minutes. 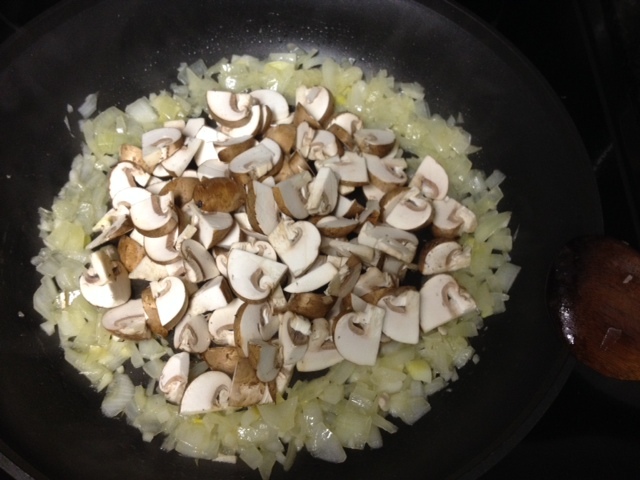 Push vegetables to the sides of the skillet, making a well, and add chopped mushrooms, shaking pan to level them over the heat. Cook mushrooms until they begin to brown, (about 6 minutes), and then stir to combine them with the onions and garlic. Add eggplant and olives, if you like or any other ingredients you normally enjoy on pizza. Stir in the tomato sauce and lower heat. Simmer about 3-4 minutes and season with sea salt and freshly ground black pepper. Remove skillet from heat. 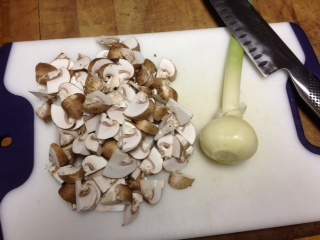 Making a well in the skillet allows the onion and garlic to cook while the mushrooms brown. In a separate skillet, heat remaining olive oil over medium high heat and add portabella caps, top side down. Oil will quickly absorb and caps will lightly sear, 1-2 minutes. Do not cook underside (the side that will hold filling). Remove caps from pan and place on baking sheet covered with foil, parchment paper or nonstick baking mat. 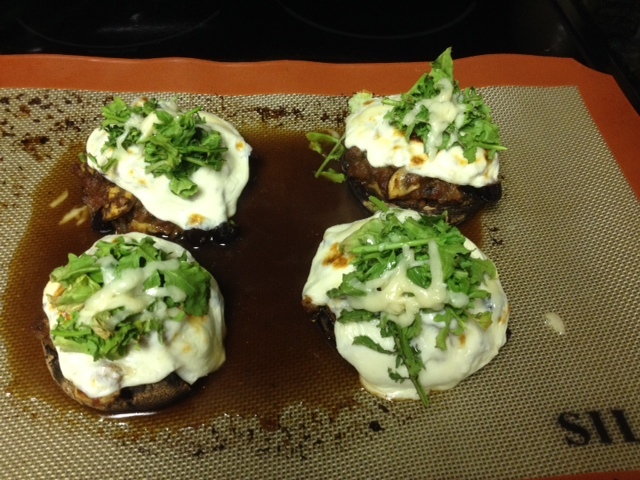 Portabella mushroom pizzas with fresh arugula hit the spot on a cold January night. 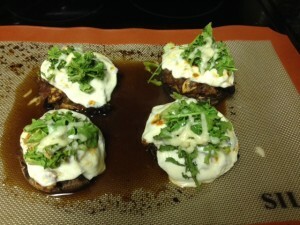 Fill caps with sauce and top with mozzarella cheese slices. Bake in a preheated, 375 degree, oven for about 12-14 minutes, until cheese begins to brown. 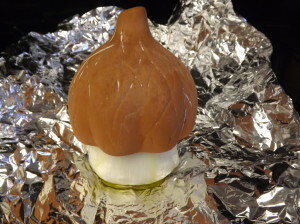 Remove from oven and set oven to broil. Top each mushroom with ¼ of the fresh arugula leaves and sprinkle ¼ of the Parmesan cheese over each. 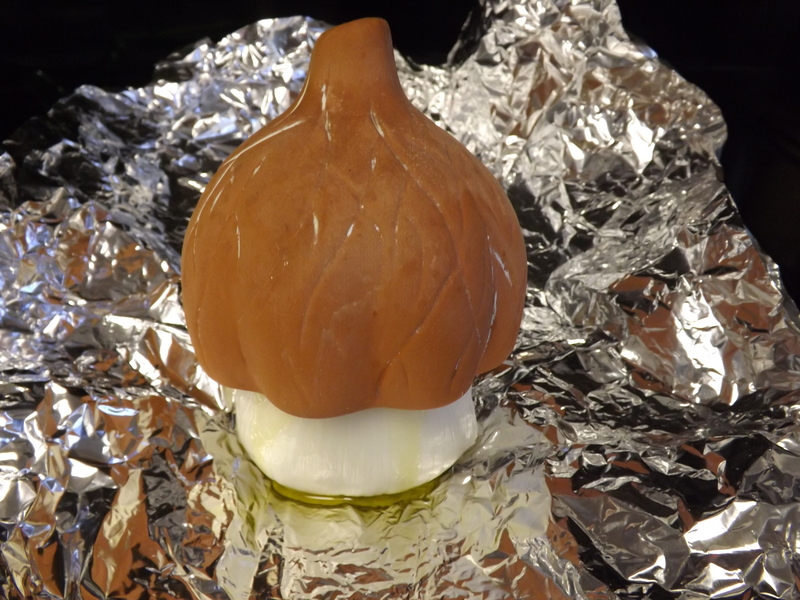 Briefly broil in oven until cheese just melts, 1-2 minutes. For a non-vegetarian dish, ground beef, venison or sausage, browned, may be added to the tomato sauce mixture. 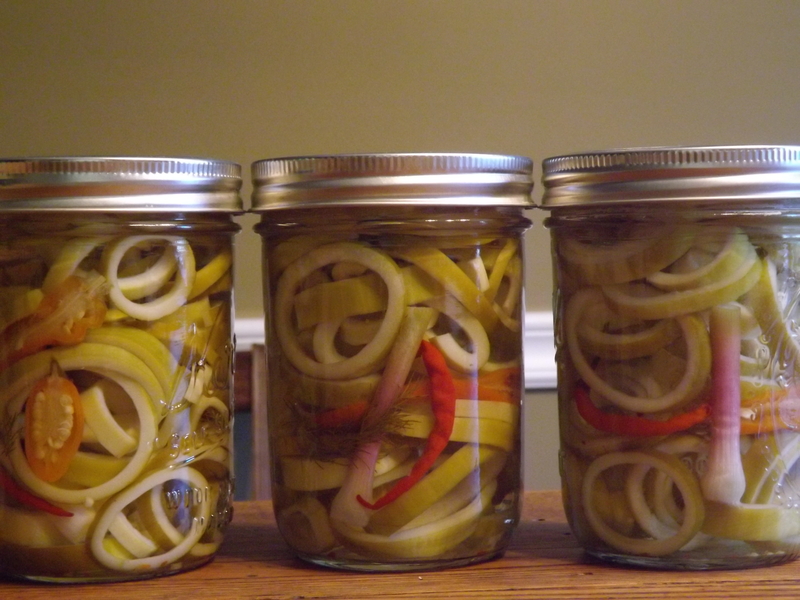 *During their season, I preserve fresh eggplants in a mixture of olive oil, vinegar, peppers, herbs and spices. Stored in the refrigerator, we often use the eggplants in a variety of dishes or just eat them from the jar. Refrigerated eggplant should be removed from the fridge prior to using to allow the solidified olive oil time to return to a liquid state. This entry was posted in Heirloom Seeds on January 16, 2014 by cindybarlowe.